"His Royal Highness Prince William Henry," book illustration for Hervey's Naval History, 1779, British Museum. 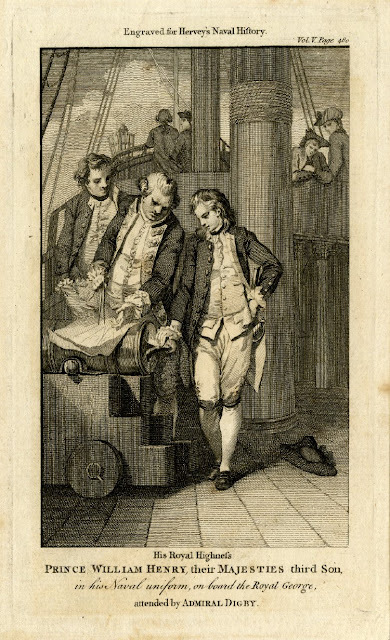 As the note on this engraving states, Prince William was the third son of King George III and Queen Charlotte. He was destined to become King of England for seven short years, and his service in the Royal Navy earned him the moniker "the sailor King." Here he is portrayed in his youth, a mere boy at 14, serving under Admiral Digby as a Midshipman aboard the Royal George. Digby illustrates the finer points of navigation to the young prince. Despite his royal blood, William was treated the same as any other midshipman...mostly. Following a plot to have him kidnapped by the American rebels, he was assigned a personal guard. In 1779, those days were yet to come. Until then, the royal midshipman was busy learning the ropes. Looking over his shoulder are a pair of sailors leaning over the rail of the sterncastle, watching his lessons with interest. The fellow on the right is probably an officer. 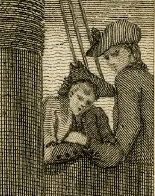 His hair is tied in a queue (which is difficult to see in this low resolution detail), his hat would be abnormally large for a common sailor, and its cockade is big. On the left is a common Jack. He wears a jacket with scalloped mariner's cuffs bearing three buttons on his right and two on the left. Beneath is a single breasted waistcoat which appears to be open. His cocked hat is reversed with a somewhat smaller cockade on the right. There is the real possibility that we are looking at a fellow midshipman. He stands on the sterncastle surrounded by officers, without another common sailor in sight. Given his slouching posture in the presence of another officer I lean toward the original assumption, but stress that this is an assumption and not definitive. What do you think? TOMORROW: Sail on the Woodwind!